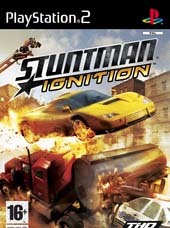 Another death defying instalment of the Stuntman franchise returns on PlayStation 2 entitled "Stuntman Ignition" that transforms gamers into a Hollywood stunt driver. As a stuntman, gamers must embark on a variety of missions for films, commercials and tournaments by performing a variety of stunts with over 25 unique and memorable vehicles. To keep things fresh and exciting, developers Paradigm Entertainment have not only included exotic sport cars but also strange new editions such as hovercrafts, making this one of the most unique Stuntman titles to date. It doesn't seem like 5 years but that's when the original Stuntman game hit the shelves that not only challenged the gaming industry but proved that car games were not just made for racing. Sure the gameplay may have been difficult to master but that's what being a stuntman is about... making the impossible seem possible. 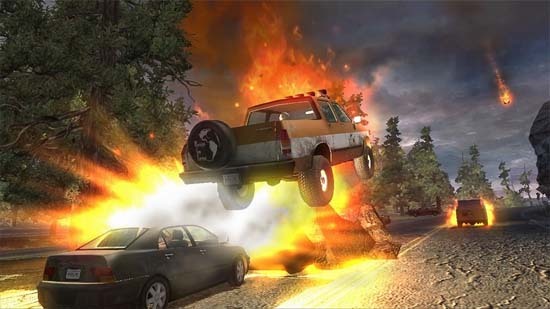 In its essence, Stuntman Ignition allows the gamer to start from a simple wannabe stuntman as they become more and more known in the world of Hollywood. The title is a combination of racing meets demolition derby as you jump, crash, slide and move through a variety of obstacles in order to create spectacular stunts. Fortunately for those who may be a little rusty from the original title, Paradigm Entertainment have carefully ensured that the gamer isn't thrown into the deep end of the pool as your stunts start from simple drifts to small jumps. With this in mind, the control system is carefully mapped on the PlayStation 2 DualShock controller with the analog sticks used in conjunction with the D-Pad and shoulder buttons to neatly create a quite playable title. However, the gameplay does suffer from a few extremely difficult levels which will cause a good set of frustration for even the most patient of gamers. Although trying to avoid spectacular crashes is your aim, the title will give you a few chances before the entire "stunt" has to be re-shot which will gradually become more and more difficult as you progress. A simple slight move to the right or even left can spell disaster for the stunt. To make things a little easier (besides choosing "Easy"), there are a few in-game cheats such as arrows and markers which will give you that slight edge in mastering the stunt. Needless to say, you really need to be a DualShock wizard if you are to pull off these stunts on the first go. The game also offers a variety of different multiplayer options such as tournament mode and black lot battle which offers the gamer some great replay excitement from stunts to racing. There are also a variety of different mini-games but the main crux of the title is the career mode. 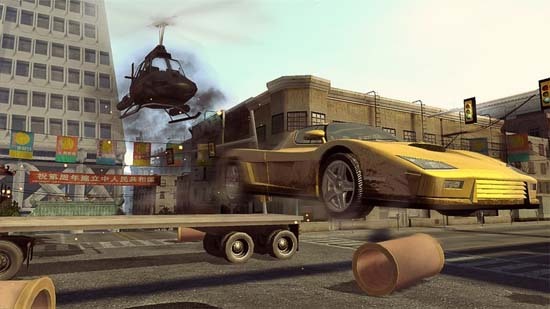 The star of the show are easily the amazing stunts that have been faithfully recreated in this title which are nicely rendered by the spectacular graphics engine. All the backgrounds in the game are quite detailed and the developers have ensured that there are a variety of different and exotic locales to keep the gameplay fresh. 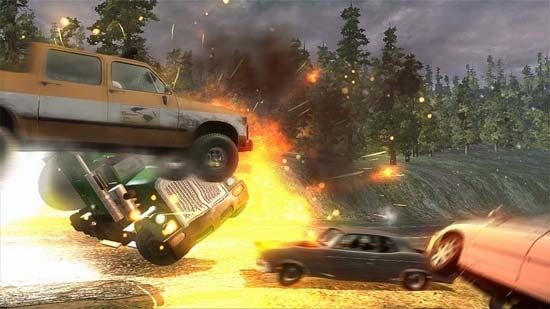 The vehicles in the title are quite realistic as are the Hollywood style explosions and realistic gravity that make this quite a decent looking game on the PlayStation 2. To go hand-in-hand with the graphics is a Hollywood sounding block buster soundtrack with a variety of realistic sound effects. I must admit that watching some of other reviewers playing this title was actually quite entertaining and it was almost like you were watching a movie. In conclusion, Stuntman Ignition is a rather good title on the PlayStation 2 but does not offer the market too much in the terms of gameplay. Although it's a sequel upon sequels, Stuntman Ignition does have a few new additions that will make lovers of the old franchise jump with glee. Even if you've never played the Stuntman franchise before, than I would recommend you check this title out if you're interested in a technical racing game that although does become excruciatingly frustrating, if you can master the controls than that is more than enough reward in itself, especially seeing your final stunts.